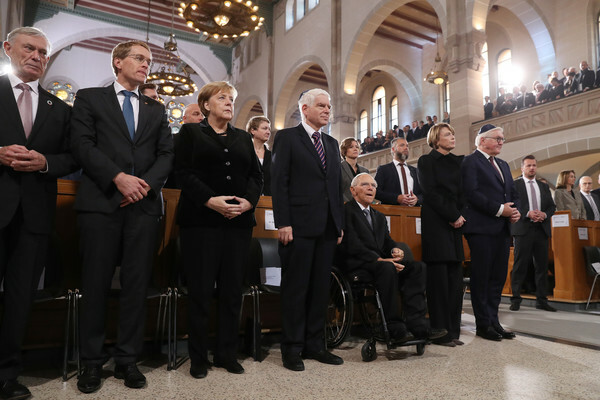 (From L to R) Former German President Horst Koehler, politician Daniel Guenther, Chancellor Angela Merkel and Central Council of Jews President Josef Schuster, Bundestag President Wolfgang Schaeuble, First Lady Elke Buendenbender and German President Frank-Walter Steinmeier attend a ceremony at the Rykestrasse synagogue to commemorate the 1938 Kristallnacht pogroms, also called the November pogroms, on November 09, 2018 in Berlin, Germany. During November 7-13, 1938, Nazi supporters attacked over 1,400 synagogues as well as Jewish businesses and individuals that led to the deaths of over 400 people in a violent outburst of anti-semitism that preceded the horrors of the Holocaust. Germany is officially commemorating the 80th anniversary of the pogroms today.